Noam Chomsky applies a rational, scientific approach to disciplines as diverse as linguistics, ethics, and politics. His best-known innovations involve a groundbreaking theory of generative grammar, the revolution it initiated in cognitive science, and a radical encounter with political theory and practice. 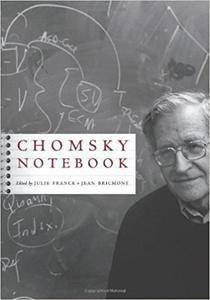 In Chomsky Notebook, Cedric Boeckx and Norbert Hornstein tackle the evolution of Chomsky's linguistic theory. Akeel Bilgrami revisits Chomsky's work on freedom and truth, and Pierre Jacob analyzes his naturalism. Chomsky's own contributions include an interview with Jean Bricmont and an essay each on Edward Said and the natural world. Altogether, these works reveal the penetrating insight of a remarkable intellectual whose thought extends into a number of fields within and outside of academia. For the uninitiated reader and longtime fan, this anthology attests to the power of Chomsky's rationalism and the dexterity of his critical investigations.